Under can’t make it up comes the Met Office adding Scarborough to Datapoint and Swanage vanishing. Figure 1, photograph ©2013 Copyright Christopher Hall under CC, annotation, the author, same licence. Just above the hedge can be seen the top of a World War II pill box. This was sited to give protective cover to the Royal Navy radio station in Sandybed Lane at the foot of the hill. The fenced flat area in the background is Springhill Reservoir opened in 1928 to augment the town’s water supply at a time when new developments were taking place. Water is pumped to here from Irton Waterworks. 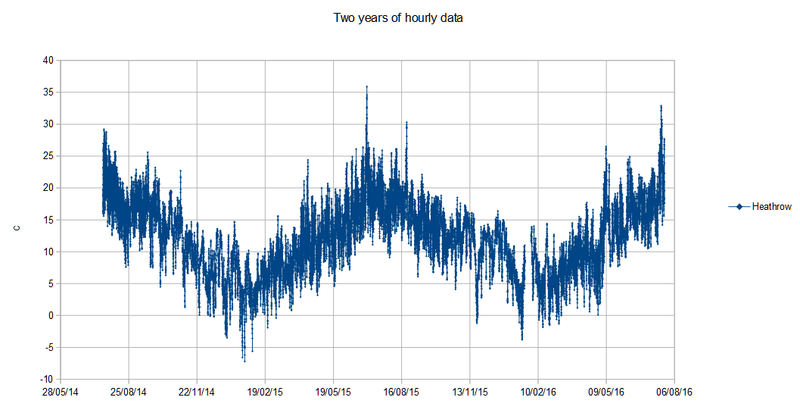 I am making available all the data collected from Met Office Datapoint for UK land stations. Example of data processed to show deviations. This is hourly from 22nd July 2014 through 28th 31st Dec 2015, missing, etc. excepted. The data has been processed into time series with missing data filled with not available marks and also the verbatim datapoint XML as received. A Talkshop page has been added, can get to it via top menu Portal, direct link here. This ought to be a gold mine for those able to work on data. Millions of datapoints. 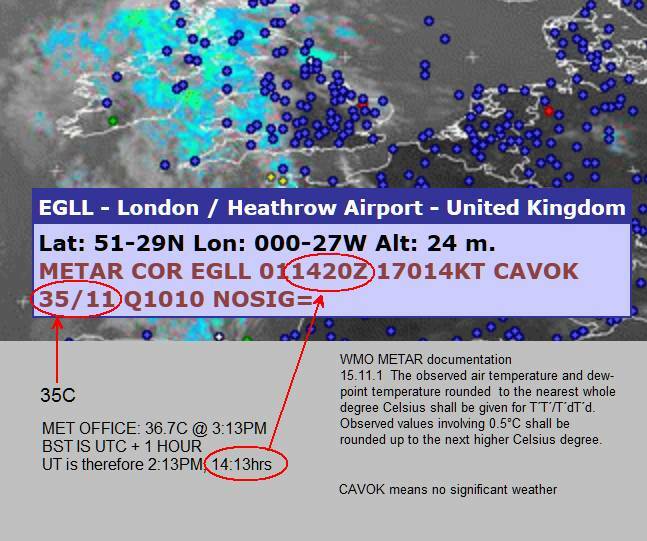 The Met Office do not archive this immediate data for public access so whilst there are defects, you’ll have trouble finding this elsewhere. Tim writes, on the way back home from a visit to a secluded bay I visited the small Swanage met site. This is a report, not a site citicism, it’s fair enough for what it is. Arriving late in the day as the sun touches the local horizon is a bad time for photography, add in exhaustion from earlier, this was going to be a brief look. The Swanage Met Office AWS reports hourly temperature and humidity, probably rainfall. As a station it is not synoptic, will be based on an old seaside town site, hence some furniture in the enclosure which has nothing to do with the Met Office. Figure 1 Swanage met station looking SE, this is two joined images . The site is about 30 ft above sea level on an unstable sloping terrace then with a steep slope to a road, promenade, and sandy beach with breakwaters. Note the low trees in the background, have that windswept look. The land here is sheltered by a ridge from the south-west gales (setting sun is touching the ridge). The tree there implies a more southerly strength and on-shore summer breezes. The Met Office have some explaining to do. Why 7 minutes after a claimed hottest ever did the same place publish a safety record at least 1.2C lower? It was lower 7km, away at Northholt and all the surrounding places. Muttering about thunder won’t wash either because CAVOK says no, if it is correct. Plume from France? It was much colder to the south, Met Office data says so. Fohn? Ah yes the snow capped Sussex Alps. Image from OGIMET, no link given to protect private server from excess traffic. Someone please cross check me in case this is mistaken. The 11 figure is dewpoint, also in contradiction. Then there is the matter of Met Office Support giving the author the runaround since January over wrong meteorological hourly data emitted by the Met Office servers. The similarity is curious. 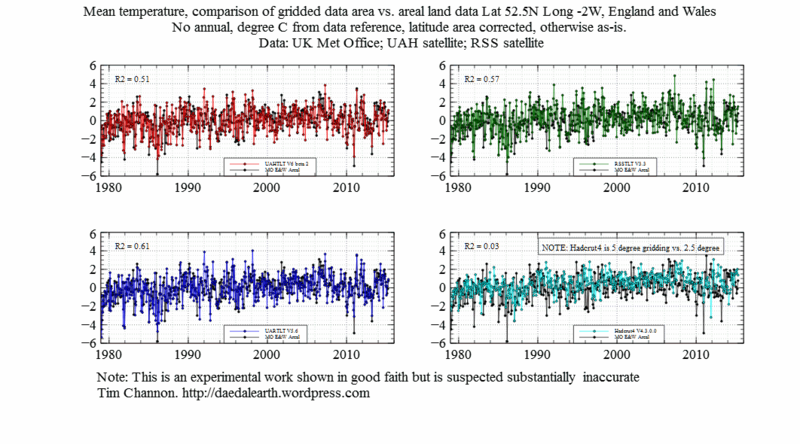 Figure 1, overlay plots of pairs of almost raw datasets, in each case the Met Office areal mean temperature data for England and Wales, less annual, against gridded UAHTLT V6 beta 2, UAHTLT V5.6, RSSTLT V3.3, Hadcrut4 V4.3.0.0, the latter is unfair because it is gridded at 5 degrees instead of 2.5 degrees. In all cases the geographic area overlap is very approximate. Click image for larger but preferably download this PDF (106KB) since as a vector plot zoom/enlargement and pan allow examination in great detail. During a recent cold snap there were at times clear skies and a calm. Here is evidence of a profound difference between Met Office sites when site exposure and UHI thermal mass can upset natural radiative cooling. The Farnborough site is in my estimation WMO Class 1 whereas RHS Wisley is poor, in an orchard designed to make a microclimate. Wisley however has been cited in literature and government chambers (and by Phil Jones) in relation to UHI in comparison with a record setting London site, specifically a site I have omitted from the surfacestation work. Overloaded with too much information. I may be boring folks yet detail is what breaks to understanding. This is rather fun, things fit. Hourly data, a peak temperature which elsewhere seems to coincide with a short period of high visibility, probably sunshine. But look at the green wind data trace, falling west wind, calm, east wind then resume west. Humidity drops low. The station is on a tidal estuary. New information has appeared so this is based on photographic evidence. The drawings are approximate and simple. Those who want to look and with access to Google Earth here is a ZIP of Google KMZ files (4kB). Invoke and will go to the image for the date given. The Met Office station commenced operation during 1996. It is not a full station. I assume it is treated as a minor synoptic station. 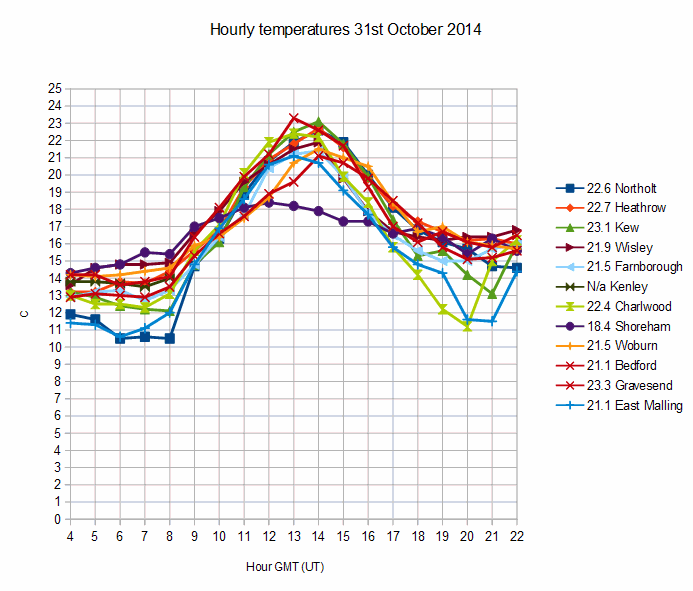 Last day of October 2014 (31/10/2014) was lovely and warm over much of eastern England, particularly the south east. Mostly weak sunshine and a slight southerly wind. 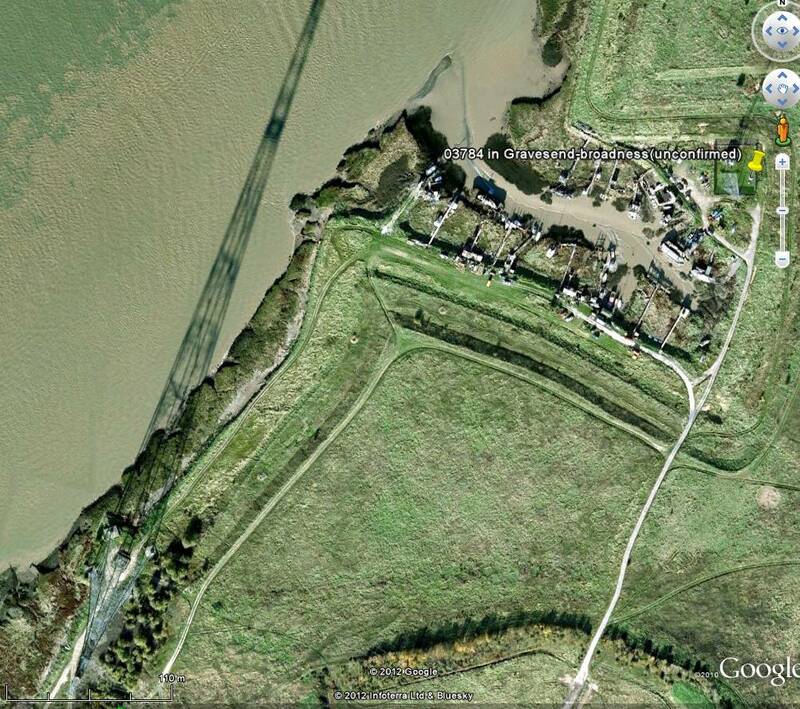 The Gravesend site has in the past been the subject of questioning why it is so warm, estuary, not in town. There was a south wind too in the Cairngorms where the temperature gradually rose all day, with a twist, the wind was rising from 48 mph to 60+ mph, gusted to 84 before last thing the wind shifted and fell. This suggests a general flow. This confusing plot shows an unusual situation. The highest temperature was recorded at Gravesend, logged by the Met Office as 23.6C, 0.3C above the hour mean. The oddity is this occurred an hour earlier than the other group of stations, or perhaps is an effect of quantisation. This article is cross posted from Tim’s blog as of interest to some Talkshop readers with a few extra sentences likely to raise discussion. August 2014 there was a meteorological gift of both exceptional conditions and good data. What can be learnt? Three Met Office sites showed a signature of exponential cooling. This requires clear sky and a calm. Given somewhat limited parameter hourly data the following shows the commonality. The computed terminal conditions are shown later in this article. 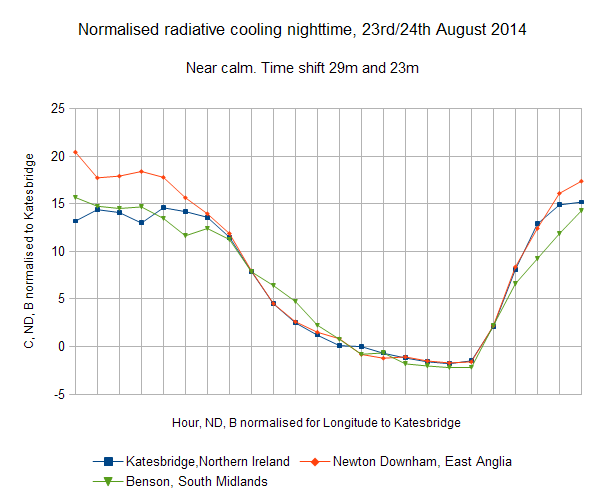 Benson and Santon Downham data has been normalised to Katesbridge, which has the least noisy data or the three. Dusk appears to be the important factor, a surprising finding, I assume cooling is time from dusk, dawn terminates cooling. 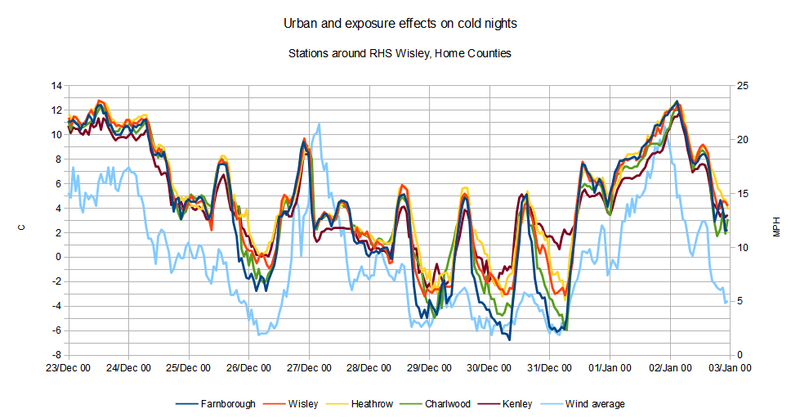 Temperature normalisation defined is for the cold period, not as accurate for Benson where the better site exposure (more open) led to more wind at times.